Feb. 27, 2017, 2:06 a.m. The AR 15 rifle isn’t a complicated rifle and most people can build one by themselves with little to no training. One of the more complicated systems in the AR 15 is the gas system. More specifically, different length gas systems. Some folks already know there are many gas systems sizes, and some reading these are just now finding out. So for the latter group, we are going to dive deep into the different gas system lengths used in AR 15s. We will help you can choose the perfect length gas system for you. The AR 15 is a direct impingement rifle. This means some of the gas created by the round fired exits the barrel into a port on the 12 O’clock position on the barrel. This port connects to a gas tube that feeds the gas into the receiver. The gas strikes the gas key on the bolt carrier group and cycles the rifle. The bolt carrier group retracts and extracts and ejects the round. The buffer and buffer spring send it forward to complete the rifle’s operation. There are 4 different lengths for a gas system. Pistol, carbine, mid-length, and rifle. If you can’t tell, the length of a gas tube changes as the barrel length changes. The gas tube length should increase as the barrel length increases. The big question is why? A universal system would make more sense, but unfortunately, that simply doesn’t work. This is due to how long the projectile stays in the barrel. This is called dwell time. Dwell time differs between AR rifles due to barrel length. As you’d imagine the longer the barrel the longer the dwell time. Your choice of ammunition can also create differences in dwell. Heavier, slower rounds have a longer dwell time. This only affects reliability in extreme cases. A gas system must match the barrel length of a rifle due to dwell time. If it doesn’t you’ll run into two distinct issues. If the gas system is too long and the barrel is too short the gun will likely run sluggishly. This can cause a variety of issues including failure to eject and extract. The rifle’s ability to cycle will be impaired. Alternatively, if you have a barrel that is too long and a gas system that is too short you’ll run into over gassing. An over gassed system will operate…. For a little bit. An over-gassed rifle will be throwing that bolt carrier group rearwards hard, fast and hot. Sounds great, however, it will start to beat the gun. This will lead to increased wear and tear on the rifle, and wear it out faster than a matching gas system. Let’s Look at the different lengths. Pistol - AR pistol length systems can be used in super short barrels. This will function perfectly in both pistols and short-barreled rifles. A pistol length gas system is used for barrel less than 10 inches in length. The gas port is located about 4 inches from the muzzle. Carbine - Carbine gas systems are what you find on Mil-spec rifles. Carbine gas systems are perfectly suited for 14.5-inch barrels. That is their sweet spot. However, they’ve been known to work well with 10 to 16-inch barrels. Mid Length - Mid-length systems are some of the most common on the market. The use of mid length systems is commonly associated with 16-inch barrels. Using a mid-length system on a 14 or even an 18-inch barrel isn’t unheard of. Rifles - A standard rifle system is perfect for those barrels that are 18 to 20 inches in length. 20 inches is the most common rifle length, but up to 24 inches isn’t unheard of. Rifle systems are reliable in 24-inch barrels. As you see these gas systems overlap in barrel length quite often. The carbine and mid length system interchange quite often. So why would you choose one of the other if you were building a standard 16-inch barrel AR 15? Which would you choose? A carbine or a mid length? At that point, mid length or carbine are both reliable systems for your rifle. At this point, it’s all about preference. 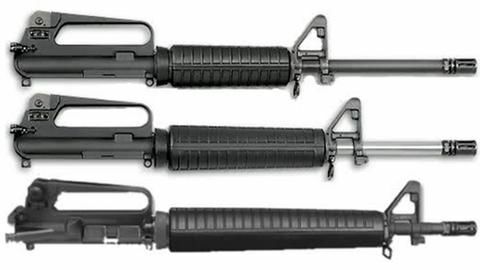 A carbine length system will give you a shorter handguard, but a lighter overall rifle. A mid length gives you a longer handguard . With a rail, this means more rail space, or the ability to use certain shooting styles. At this point, we also reach the effects of what a buffer does with a gas system. With a 16 inch barrel and a carbine gas system, you’ll need a 3.6-ounce buffer over a standard 3-ounce buffer to ensure the system runs. So if you are stretching the gas system and barrel length keep in mind your buffer can help fill the gap. A heavier buffer helps a slightly over gassed system. This will not allow you to run a pistol length gas system in a rifle reliably. However, it can smooth out a carbine system in a 16-inch barrel. So these are the basics of your AR 15 and the different gas lengths you can choose from. When building your rifle keep in mind the relationship between the gas system length, barrel length, and your buffer weight. If you can remember this you and your rifle will run fine.